The rounded titanium carbide (TiC) particles exposed on the surface of these materials provide a combination of low coefficient of friction and a hardness 30% higher than tungsten carbide (WC). This unique combination makes the steel-bonded TiC materials especially suited for wear resistant applications. 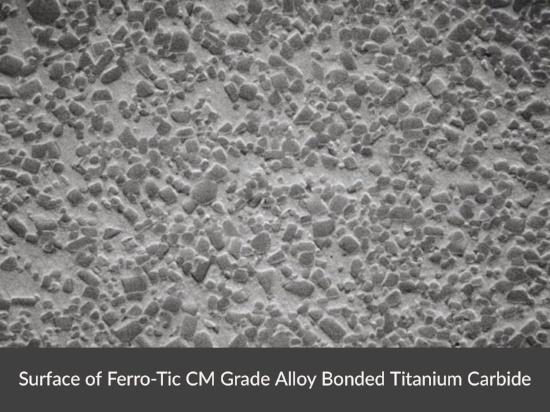 Ferro-TiC® Steel-bonded titanium carbide (TiC) materials are made using advanced powder metallurgy technologies. Unlike tungsten carbide, Ferro-TiC® is bonded by hardenable steel matrices. Ferro-TiC® provides the lightweight, size, stability, and hardness. 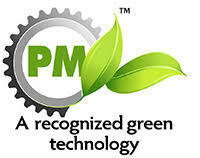 Ferro-TiC® is virtually porosity free - significantly better than the A1 ASTM B-276-79 Standard. Low specific mass. 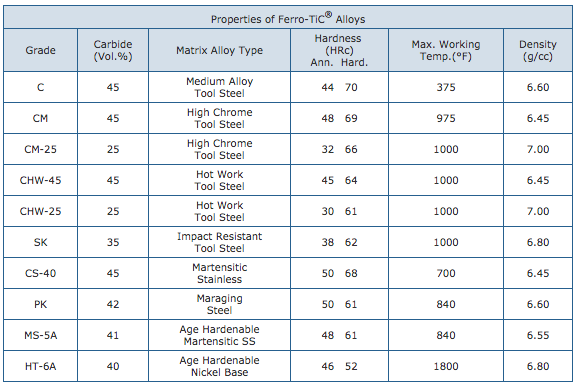 Ferro-TiC® is 10-20% lighter than its steel counterpart and about 50% lighter than tungsten carbide. Conventionally machinable in the annealed stage by milling, turning, etc. Conventionally heat treatable to achieve high hardness. 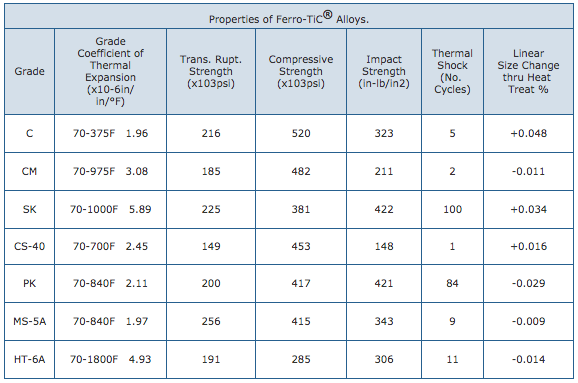 The properties tables below provide technical data for many of the existing grades of Ferro-TiC®. Some may have superior thermal shock resistance. Some are magnetic, some are nonmagnetic. Some operate under cryogenic conditions. Some offer excellent resistance to vibration. The Grades listed are those generally used for these particular purposes. However, they can and have been modified to meet specific operating requirements.